It’s hard not to like Rodrigo and Gabriela. 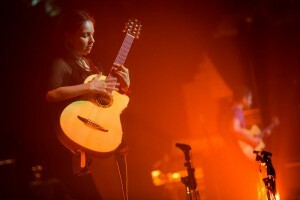 The warm-hearted Mexican duo create firestorms of infectious energy on their nylon-string guitars, and since their first visit in 2006 their popularity has surged. From playing a Newtown club they now pack the Concert Hall, their appeal having widened from an under-30 audience to embrace all age-groups. When they performed in the Enmore Theatre in 2010 their use of effects pedals endangered the wonder of generating something like the power of a rock band just with two acoustic guitars. That danger has passed, the effects being used sparingly and to add colour. Similarly the peril of Rodrigo being seduced by speedy virtuosity as an end in itself was assuaged with waves of spaciously melodic musicality. Gabriela joins players of classical, flamenco, blues, folk and more in making the acoustic guitar complete in itself, but has done it by hatching a genre that is all her own. Her flashing right-hand figures, studded with percussive hits on the sound-board, create a propulsive force that is usually the domain of the fieriest three-piece rhythm sections. It remains the duo’s greatest asset, and yet could also prove to be its limiting factor. Six years on a lack of variety in those rhythms was evident, which, when combined with Rodrigo’s penchant for pushing his solos towards predictable climaxes, could drive them into a musical dead-end. They avoided that on their last album, Area 52, by employing Cuban musicians and rhythms. That project’s linchpin, pianist Alex Wilson, joined them here for several pieces, disappointingly playing keyboard rather than piano. Initially his work seemed showy and unsubstantial until he combined with Gabriela in fanning rhythmic flames into infernos behind Rodrigo. The duo aired several new songs that were pure heavy metal rendered in nylon and wood. One suspects there are more fruitful areas of composition to explore than riff-based material laced with bombast, but that likeability papers many cracks.